The Washington Post fact checker on Tuesday gave Democratic National Committee chair Tom Perez "two Pinocchios" for falsely claiming last week that the DNC raised more money in January 2018 than any previous January in its history. "We raised more money in January, for instance, of 2018 than any January in our history," Perez said in a C-SPAN interview on Friday. "So if the question is, ‘Do we have enough money to implement our game plan?' Absolutely." The DNC raised $6 million in January 2018, the Washington Post reported, below the DNC's hauls in January 2014 ($6.6 million), January 2012 ($13.2 million), January 2011 ($7.1 million), and January 2010 ($9.1 million). 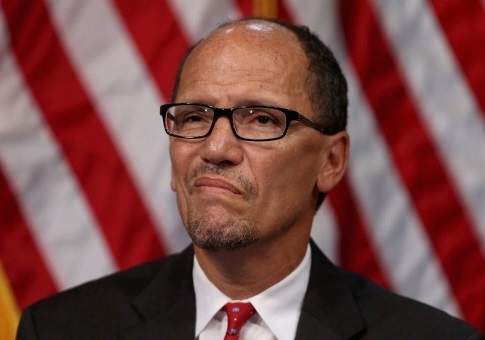 DNC spokesman Michael Tyler admitted to the Post that Perez's claim was wrong, saying, "Tom meant to say that we raised more money in January than we had in any January since 2012." The Post called the claim "quite a blunder, since the DNC's history began 164 years before 2012." Even excluding those preceding years, however, this year's total for January is less than the same month's total in 2014. Tyler explained that, for this year, the DNC is counting its own fundraising and nearly $1 million raised by the Democratic Grassroots Victory Fund, a separate entity, making the grand total "nearly $7 million." The Democratic Grassroots Victory Fund is a new joint fundraising committee, established in October 2017, which is made up of the DNC and the party committees in all 50 states and Washington, D.C.
Tyler said that the DNC raised all of the fund's money in January. The Republican National Committee does not include in its monthly totals what it raises in partnership with President Donald Trump's joint fundraising committee. The Post said that it would have given Perez "four Pinocchios," its highest rating for falsehoods, if a DNC spokesman did not walk back the chair's claim. The newspaper added that it normally does not give "Pinocchios" when a politician admits an error, but said that Tyler's explanation was not satisfying and "raised new questions. "This elaborate construct may help the DNC chairman save face, but only by sacrificing clarity and hampering voters' understanding of campaign finance," the Post wrote. "We were on the fence between two and three Pinocchios for this one, but in the end Perez's revised statement merits two Pinocchios. The numbers add up, but the spin is misleading." This entry was posted in Politics and tagged DNC, Fact Check, Tom Perez, Washington Post. Bookmark the permalink.